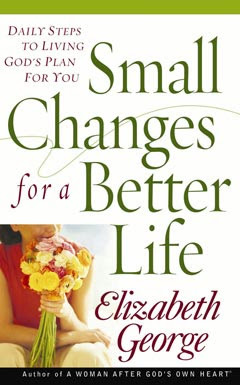 Small Changes for a Better Life is a book by Elizabeth George. She is one of my favorite inspirational/Christian authors. This is not a book review as I have not finished reading the book yet. Since it takes me a longer time now to finish a book and my epidural-laden memory, it is harder for me to write a book review. My first encounter with this book was at my very first small group meeting. Sam was going through the book and the time I attended she chose to discuss small change # 10 (Invest in Your Marriage) as the attendees were all married women. I truly miss going to a small group meeting. That was two years ago. I am finally reading the book...slowly. Chapter by chapter. As I read Small Change #1, I had this urge to blog about what I think and feel about each of the 18 changes. I want to write down and share what I learn from each of them. I hope it affects my life as much as yours.